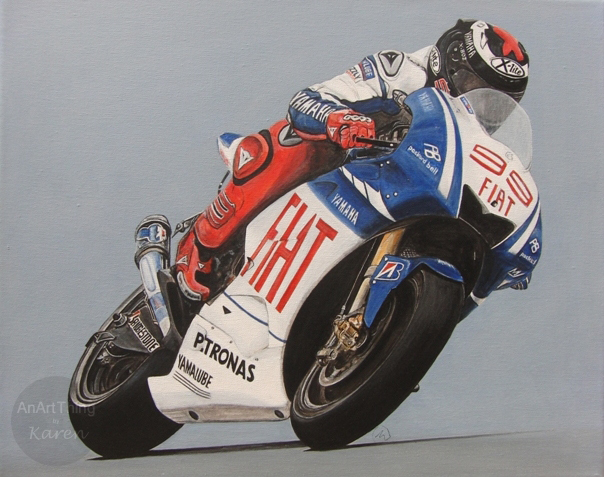 This is my latest painting – 2010 and 2012 MotoGP World Champion Jorge Lorenzo. Taken from various references and merged together. Below are the work in progress shots. On the left – after it was all drawn out. The middle picture is with the first layer of paint on. Once all of the background is the right colour – as in the right picture, I then start to work on all of the detail of rider and bike. Simply stunning work, thank you for sharing. Do you offer prints? Thank you for leaving your comment. This painting was a private commission and I am unable offer prints on this particular painting.